Using a vehicle that is specially designed for adventurous activities will be your value interest to join Bali Land Cruise to visit heart of this island. In the morning you will be picked up directly from the hotel lobby where you live. About an hour trip, you will visit an amazing stone quarry. Time seems to have stood still for centuries. Proceed with one of the houses visited you will be taken to a brief stroll around the garden to find some fruit and vegetables grown here. The journey will continue towards the hills Batukaru, in this place you will enjoy lunch at a unique restaurant located in the woods. Your last visit will arrive in a hot water bath; you will enjoy beautiful views of manicured terraced rice fields that continue to function efficiently in old age unique irrigation system. Bali Land Cruise activities will invite you to explore the Hidden nature of Bali Paradise Island. Go Steps into the rural village through the unique and muddy road, encircled by tropical grove and bush. At the same time we can view closely the beautiful of Bali Hidden nature by off road vehicle, green rice field and enjoy the atmosphere of countryside and beautiful panorama with its friendly society. At the end of this adventure we join the delicious Balinese lunch served in the local restaurant. Bali Land Cruise is a sacred adventure and spiritual exploring the hidden nature of Bali Paradise Island. You will visit an amazing stone quarry. Time seems to have stood still for centuries. The people from Tegal Jadi cut the stone, known as ‘paras', out of the cliff, the same way they have done for centuries, using traditional methods and techniques handed down for generations. At this stop you will be in typical family run farmhouse. You will be taken for a short walk around the garden to discover some of the fruit and vegetables grown here : banana, mango, rambutan, salak, jackfruit, pineapple, tapioca and more. But also look for vanilla, cloves, as well as coffee and cacao. From our kitchens tea, coffee and biscuits have been brought in the baskets on top of your car and will be served to you in the courtyard. You are now entering the rain forest where giant bamboos and fern trees abound. Sacred mount Batukaru reveals its splendor and a short stroll lead you to our rainforest camp. Built out of bamboo, cut and assembled by local craftsmen, it sits in the middle of nowhere. You will be served a delicious Balinese lunch with red or white wine. Some of the produce is straight out of the rainforest. Situated in the rice fields is a sacred hot spring where local people have always come to bath. The spring bubbles up at temperature of approximately 30°C or 86°F. You will enjoy beautiful scenery of manicured terraced paddy fields that continue to function efficiently on an age old Unique irrigation system. A jumper as the mountain temperature can be much cooler, walking shoes, Camera, Hat, Sun screen and cash. 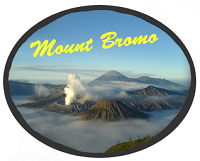 Mount Bromo or Gunung Bromo is an active volcano in East Java. The massif area is one of the most visited tourist attractions in East Java.